Why it matters: If you’re someone who uses their PC all day and gets tired of picking up the phone to respond to texts, here’s a welcome piece of news: Google is finally bringing Android Messages to the web. The search giant said the function, which was one of its most-requested features, will be rolling out today and over the next week. Being able to send and receive text messages from a desktop and laptop makes the whole processes a lot quicker than having to constantly switch to a smartphone. Google says that in addition to text, web users can also send stickers, emoji, and attached images. Once the functionality arrives on your device, simply tap the More options menu (the three vertical dots) in the app and select “Messages for web.” Then head over to messages.android.com and scan the QR code using the Android Messages app. The system is compatible with all major browsers, including Chrome, Firefox, Safari, and Edge at launch. It’s highly recommended that the feature is used over Wi-Fi, though it does work over cellular data, too. Third-party solutions such as the excellent Pushbullet have allowed Android users to text—and more—from their computers for a while now, but these often suffer from glitches, can be fiddly, or charge fees once a certain number of messages have been sent within a month. In addition to Android Messages for web, users can now hit the “+” icon to search for and send GIFs in the app. Smart replies, which tries to speed things up by predicting your responses, is also being added, and web links can be previewed before they’re opened. Lastly, the app now lets you easily copy one-time passwords or verification codes from sites such as banks. 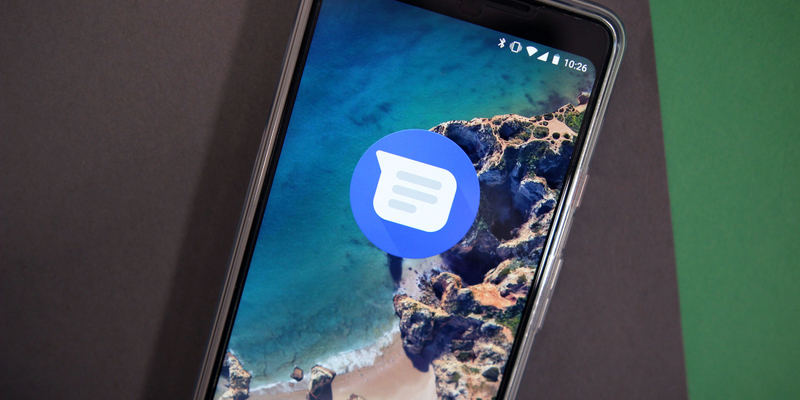 Enabling a desktop version of Android Messages is part of Google's push toward supporting its RCS-based messaging service, called Chat, which it hopes will replace traditional SMS. The company has been working with carriers to support RCS, which can use a phone's data plan and allows read receipts, full-resolution images and video, typing indicators, improved group chats, and more. It should allow Google to compete with the likes of iMessage, WhatsApp, and Facebook Messenger, though Google’s version does lack end-to-end encryption.